Dave T. is a big fan of the Lost and Found part of Daily Diesel Dose. He likes it so much he sent me more than few photos that I will post over the coming weeks. 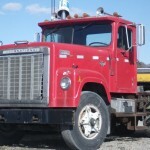 Today we have three old trucks that you could find at nearly any classic truck show. A GMC General, International Transtar 4300 Eagle and the ever popular R-Model Mack. 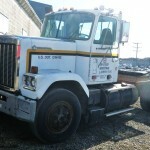 These trucks reside at a Yorkville, NY based construction company. Thanks Dave! 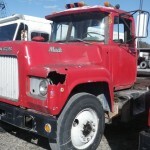 This entry was posted in Lost and Found and tagged gmc general, international transtar 4300, mack r-model. Bookmark the permalink.